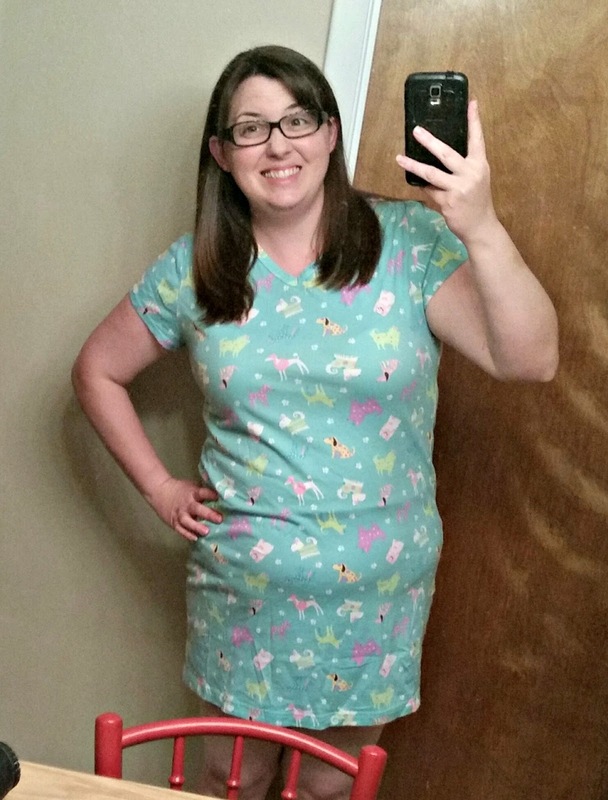 This is a post with 2 finished projects! Aren't you lucky?! lol A few weeks ago I was really wanting to do some sewing, but lately I've been very weary of starting any large projects. I have so many other things I'm already obligated to that having a project going and not being worked on just makes me feel like I fail at managing my time. So instead of cutting out a new skirt or something, I turned to me pile of things to refashion. I picked a few simple things from the stack and got to work. I grabbed this piece first. My mom recently gave me this night shirt. It was one my grandma wore when she lived at my parents house in her last few months. It has a cute print of pastel colored cartoon dogs, but it was a less-than-attractive look for me. 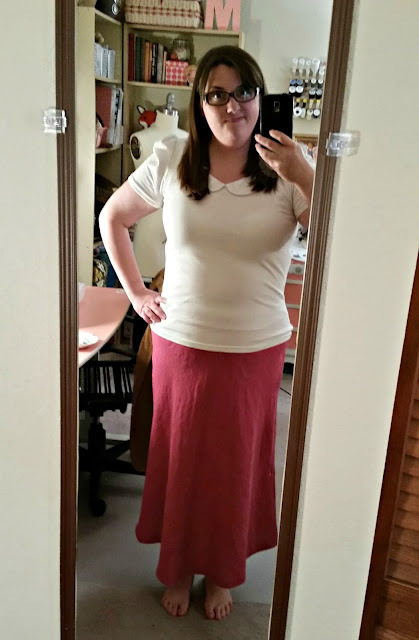 The entire shirt was made of rib knit, so it sucked to me tummy plus it was much too short for my liking - even as a night shirt I like things to be closer to my knee or it feels pointless. 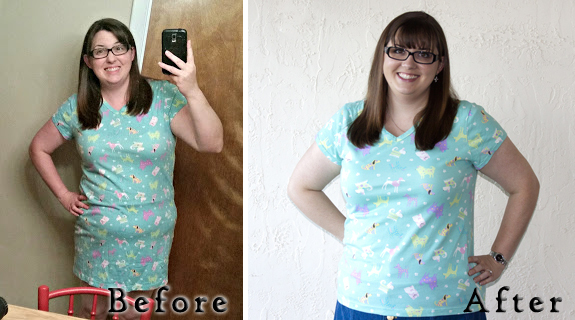 I only share this photo to show my dedication to "before and after" refashion evidence, lol. 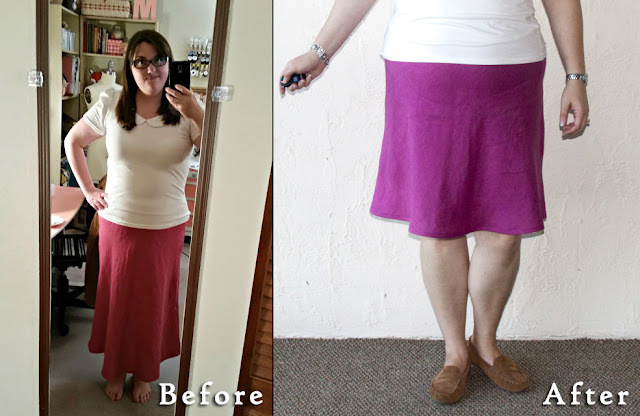 The nice thing is that this is a really easy refashion to do - just cut it shorter and redo the hem. Hooray! For my new hem I used woolly nylon in the bobbin and top stitched with a twin needle in coordinating thread. And done! Now I can enjoy this cute shirt and remember my grandma :) It's been super comfy and a fun little shirt when I'm feeling casual. It makes a great dog walking shirt, lol. 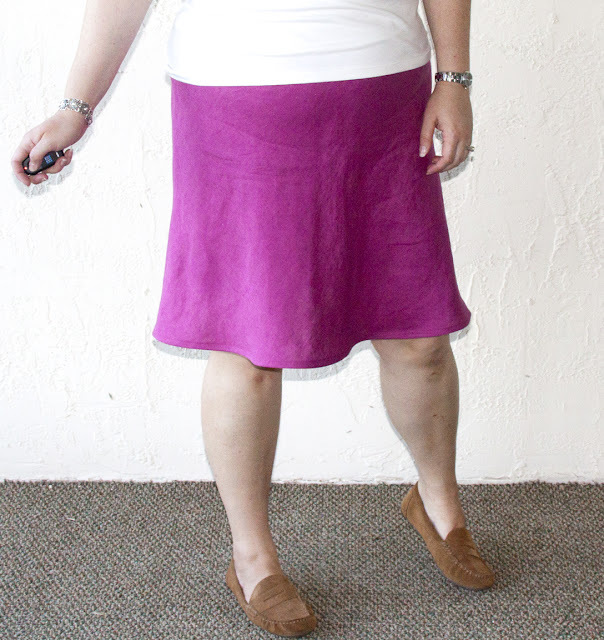 I picked up this bias cut linen Spiegel brand skirt at my favorite thrift store bag sale a few weeks ago. It was an odd 90s length that I totally hate - not long enough to be "maxi" but not short enough to be "midi". Just an unattractive slightly-lower-than-mid-calf length. I love the color and that it's linen, plus being a 80s-90s kid I couldn't resist the fancy feeling of owning something from Spiegel, lol. So I bought this for about $0.36 and decided to shorten it. 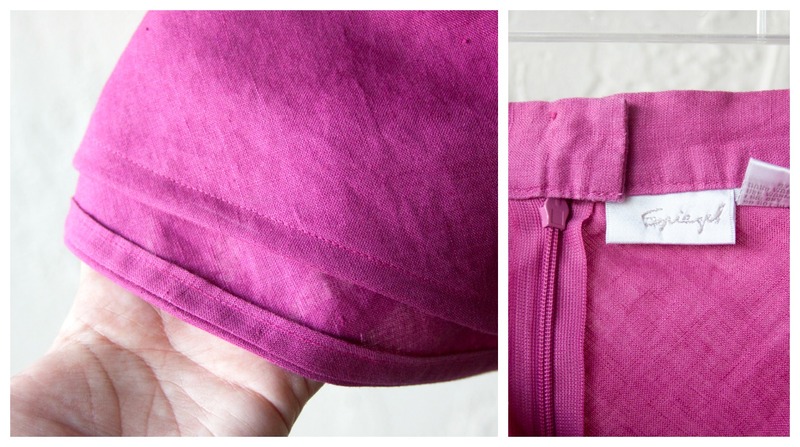 Here's a closer look at the new hem. I just top stitched it - again this was in hopes it would flare the hem out a bit. And who can resist that Spiegel tag - ooh fancy! So there you have it - two projects that just needed a new hem to switch them up and make them wearable :) Gotta love a simple change!